With the temperature outside at record lows this week, I can’t help but think of William Henry Bradley’s The Blue Lady. Clutching her ice skates in her left hand, she makes a cold winter’s stroll through the thin, bare trees look elegant and placid. (It is a sad contrast to the bundle of blue layers I’ve been hunkered down in as I head for the subway). The Blue Lady was Bradley’s second poster for The Chap-Book, America’s first “little magazine.” The publication was conceived of by two Harvard students, Herbert Stuart Stone and Hannibal Ingalls Kimball, Jr., who graduated the year it went into production. The Chap-Book featured poetry, prose, and art from the up-and-coming members of the artistic and literary community. Bradley, who was born in Massachusetts in 1868, had worked as a printer, a wood engraver, and a typographer before establishing a career as a graphic designer, and he had already designed the cover of the first issue in May 1894. Stone and Kimball had decided to to employ a commercial strategy that had become common in Europe: they produced posters of the cover illustrations of their magazine that would serve as both advertisements and as collector’s items. In addition to being hung in shop windows and on billboards, the posters quickly made their way into the homes of poster collectors in America and abroad. The Blue Lady is a stunning example of the early introduction of the Art Nouveau aesthetic to American graphic design, but as Paul Stirton pointed out in Modern Times, part of the Morse Historic Design Lecture Series, the poster also reflects a nuanced influence of the Japanese woodblock prints from the middle of the 19th century, which had become widely circulated among collectors not only in Europe, but also in cities such as New York and Chicago. 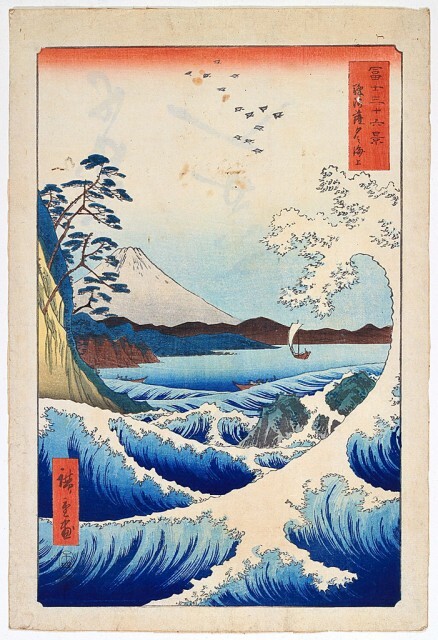 Print, Great Wave at Satta Beach, Suruga, from the series The Thirty-Six Views of Fuji (Fuji Sanjuroku Kei), 1858. Designed by Ando Hiroshige. Gift of the Estate of Mrs. Robert H. Patterson. 1941-31-120. Bradley’s design for The Blue Lady also reflects a sophisticated understanding of the lithographic printing process. The flat planes of the design lent themselves to lithographic printing. Using only two contrasting colors of ink, a sumptuous blue and a vibrant vermilion, Bradley was able to generate a third color by overprinting them, resulting in the rich, dark purple that colors the trees and the woman’s coat. Bradley also made use of the paper itself as a fourth “color,” thereby limiting the number of plates needed to print and ultimately reducing production costs. As the winter drags on here in New York, I’ll be keeping The Blue Lady in my thoughts. But I’ll be dreaming about another woman, the one featured in a poster by E. McKnight Kauffer for American Airlines to California. 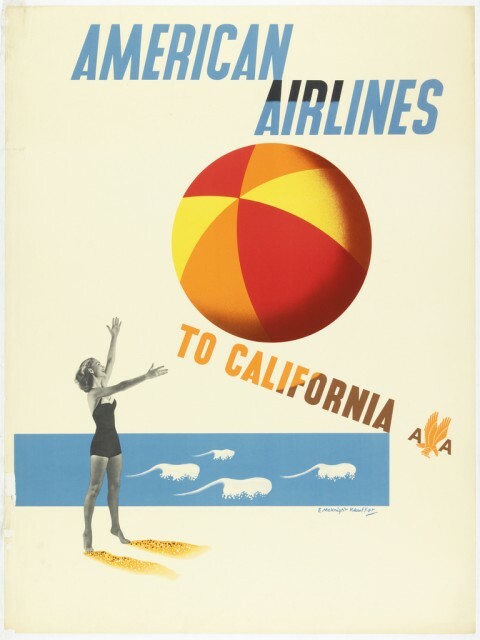 Poster, American Airlines to California, ca. 1947. Designed by E. McKnight Kauffer. Gift of Mrs. E. McKnight Kauffer. 1963-39-131. Beneath a sun in the shape of a beach ball and with the sand at her toes, she looks like she’s got it all figured out, far away from sub-zero temperatures! Poster, The Blue Lady, poster for The Chap-Book, August 1894. Designed by William Henry Bradley. Color zincograph on thin cream wove paper. Museum purchase through gift of Mrs. Gilbert W. Chapman and Ely Jacques Kahn. 2003-6-1.